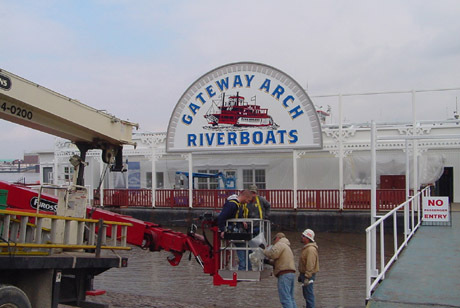 When Metro, operator of the St. Louis Metropolitan region’s transportation system, purchased the Gateway Arch Riverboat Cruises in 2002, managers soon determined that a major refurbishing in signage, graphics and architectural details on the riverboats’ barge was required to build steam into visitor numbers. The Tom Sawyer and Becky Thatcher 19th-century steamboat replicas, which make up the Gateway Arch Riverboat Cruises line, are docked on the Mississippi River in downtown St. Louis directly below the 630-foot tall stainless steel Gateway Arch, operated by the National Park Service as part of the Jefferson National Expansion Memorial. “We encourage visitors to spend more time with us through marketing the Gateway Arch Riverfront as a campus,” said Etling. While the architectural wonder of the gleaming Gateway Arch thrust high above the St. Louis skyline since 1965 is enough to attract the attention of any tourist, Etling said the riverboats needed striking visuals of their own to help entice visitors to embark upon a sightseeing or dinner cruise and to enjoy casual dining at the Arch View Café on the riverboats’ docking barge. 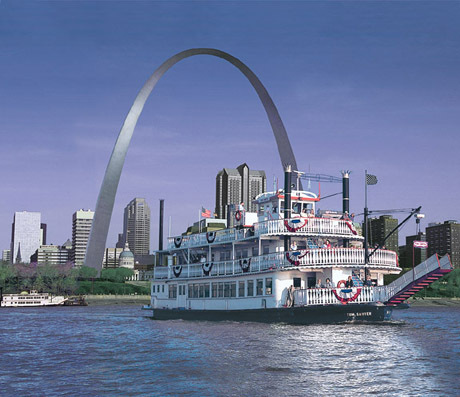 While the riverboats are visible from the Arch, guests must be drawn to walk down a series of steps from the Jefferson National Expansion Memorial grounds to the riverboats’ barge to gather information about cruises. New signage created from Dibond® graphic display board and Alucobond® material by 3A Composites USA was included in an architectural update of the riverboat barge designed by the St. Louis office of Peckham Guyton Albers & Viets, Inc. (PGAV), a firm of architects, urban consultants and planners. 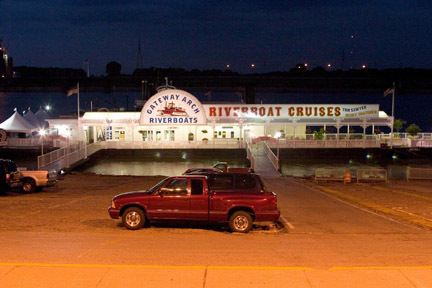 In designing the signage, Guillossou said she focused on the period look of riverboats that steamed up and down the Mississippi during author Mark Twain’s day – “large, white boats with decorative rails and brackets that were identified in large, bold type” – and included a semicircular shape in the main sign to evoke the feel of a riverboat paddlewheel. “The main sign and the entry signs, which also feature period type, help the entire barge appear more like a riverboat,” she said. Additionally, the main sign was designed to draw attention to the riverboat cruises from the Arch steps, according to Guillossou. It succeeds in doing so with its grand scale. 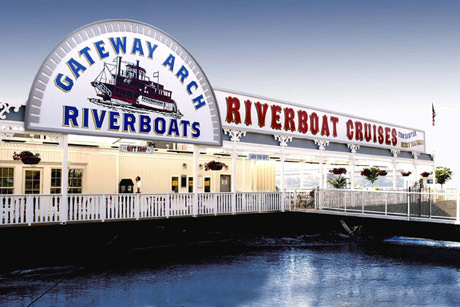 The white semicircular sign featuring the image of a period steamboat with paddlewheel and the words “Gateway Arch Riverboats” in blue vinyl lettering stands 16 feet tall and measures 30 feet in diameter. 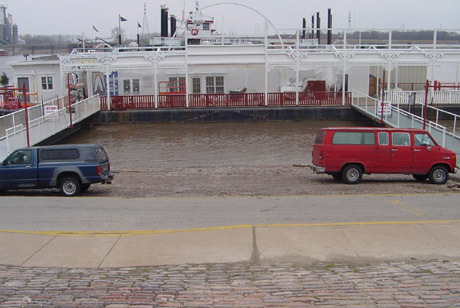 It is positioned adjacent to a white 80-foot-wide by 6.5-foot tall rectangular sign emblazoned with “Riverboat Cruises” in 4-foot-tall red vinyl letters. 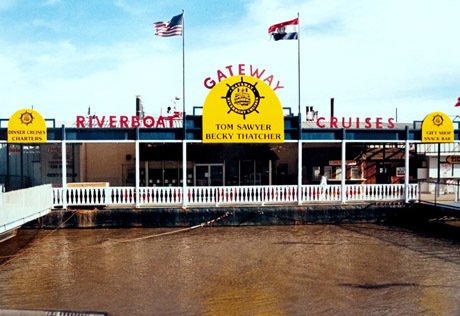 Individual riverboats Tom Sawyer and Becky Thatcher – named after characters in Mark Twain novels – are listed in blue and gold vinyl lettering at the end of the rectangular sign. While Dibond graphic display board originally was specified for smaller signs on the barge, including menu boards and café and gift shop locaters, it also proved to be the perfect material for the main sign, according to Ed Brimer, president of Engraphix Architectural Signage, Inc., in St. Louis, which fabricated the riverboat signage. Dibond is an easy-to-fabricate lightweight-yet-rigid aluminum composite material consisting of two pre-painted sheets of .012-inch aluminum bonded to a solid polyethylene core – a unique composition that makes it approximately one-half the weight of aluminum. Dibond, the flattest panel on the market, offers a superior surface that protects expensive digital and screen-printed graphics. Dibond won’t bow or oil can, and it offers excellent durability in outdoor applications. Dibond colors include white/white, white/black, dark bronze/fine silver, hunter red/caution yellow and ultra marine blue/white. A polyester clear coat is applied over Dibond’s brushed aluminum finish to create Dibond Brushed Silver and Dibond Brushed Gold. Engraphix utilized 40 sheets of 4-foot by 8-foot white Dibond in the 3 mm thickness to construct the riverboat signage, spending approximately eight weeks in engineering/structural design and fabrication. The semicircular sign was cut with a Gerber Sabre router and fabricated in four sections for transportation to the job site. The riverboat image, designed by PGAV, was digitally printed using 3M Scotchprint® Graphics onto white vinyl with an adhesive backing and finished with a clear lamination film. The image outline was hand cut by Engraphix staff. Dentil molding decorating the semicircular sign piece was cut with a Gerber Sabre router from Sign•Foam3®, a high-density polyurethane board by Sign•Arts Products Corp., and painted gray. The dentil molding was attached with concealed screws positioned through holes drilled in the back of the Dibond. Engraphix chose to construct a third large graphic display piece – a 9-foot-tall by 6-foot-wide period clock – from a 62-inch by 196-inch sheet of 6 mm white Alucobond composite material. 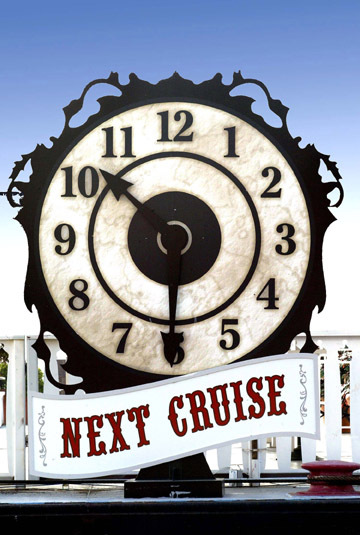 A white Dibond sign announcing “Next Cruise” in red vinyl lettering is positioned beneath the clock. Engraphix hired Piros Signs, Inc., of Barnhart, Mo., to install the large signage with two cranes – one to lift the sign pieces and another to lift the employee completing installation over 50 feet of water in front of the docked barge. The signs fit the framework, and Brimer credits the successful installation to careful planning. Etling gives the new signage a great deal of credit for drawing the notice of visitors on the Arch grounds to the riverboat cruises.